Happy WifeStyle™ is Nutritious Life Certified through The Nutritious Life Studio. I was so happy to find out about this course. Why? Because nutrition has always fascinated me and I'd learned so much on my own over the years, but wanted to become a certified nutritionist so I can help even more people and be even more confident in answering their questions. This course taught me so much about exactly what I want to help others with, to literally teach them how they can live their most Nutritious Life. I've always taught people that it's about LIFESTYLE, not just food. Many things work together to help us make good food choices every day and I now have a better understanding of how I can help people with that. I strive to empower women in many different ways on Happy WifeStyle™, so when I learned this course taught people how to "eat empowered"...I knew I was in the right place. I knew the things I wanted to learn more about. I wanted to learn more about the details of nutrition and how it works in our bodies so I could answer questions more confidently. I wanted to learn more about emotional eating and how to really help people with that...not just encourage them but actually help them with action steps to help change their relationship with food. I wanted to know more about how to talk to people about allergies vs. food sensitivities vs. intolerances...which are so prevalent today. I wanted to be up on all of the current diets people are on these days...like paleo, vegetarian, vegan, raw....and the pros and cons that may come with them...when someone may need to supplement. I wanted to learn how to help people get results that last a lifetime. I knew I wouldn't be working as a dietitian in a hospital helping diabetic patients get well...so that wasn't the training I was looking for. I wanted a course that was current...not one that was going to teach me about some outdated food pyramid, right? This course taught me everything I wanted to learn, and nothing I didn't. Maybe you're like me, and want to gain more knowledge on nutrition and get credentials. Maybe you're looking to make this your whole business, being a nutritionist...coaching clients one on one. This course teaches you EVERYTHING you need to know to start coaching clients. From intake forms and scheduling, everything about nutrition, how to design meal plans, how to communicate with your clients effectively... even the business side of things. The Nutritious Life Classes are taught by Keri Glassman, a celebrity nutritionist who is amazing. She knows her stuff and delivers it to you in such an effective way. Each level is taught by her in a video format with downloadable training and tools to study. You then have to pass a test at the end of each level to move on the the next level. I absolutely loved learning from Keri. She is so knowledgable and relatable. I got to spend some time with Keri this year and she is just as delightful in person as she is on TV! Plus, the learning doesn't stop once the course ends. New information is always being added for you to view and you get lifetime access to Keri and all the other graduates in a closed Facebook Community. Keri also offers special Masterclass trainings to alumni. The Nutritious Life Studio is also accredited by the American Association for Drugless Practitioners (AADP), so once you complete the course you can apply to become a Board Certified Holistic Health Practitioner to go along with being Nutritious Life Certified. This can add even more credentials and legitimacy to your business. I did! I highly recommend this program to anyone interested in nutritionist certification to help others live their most nutritious life...and YOURS too! Oh...and the best part is, it's a 12 week course but it's an online, go-at-your-own-pace course, so you have no excuses that you don't have time...you make time. What's more? ...this course is accredited by The American Academy of Nutrition and Dietetics. There you have it! I thought you all might be interested in how I got certified in case you'd like to just gain knowledge...or start a whole new career! The link below should answer any questions you may have. Here's to living our most Nutritious Life! 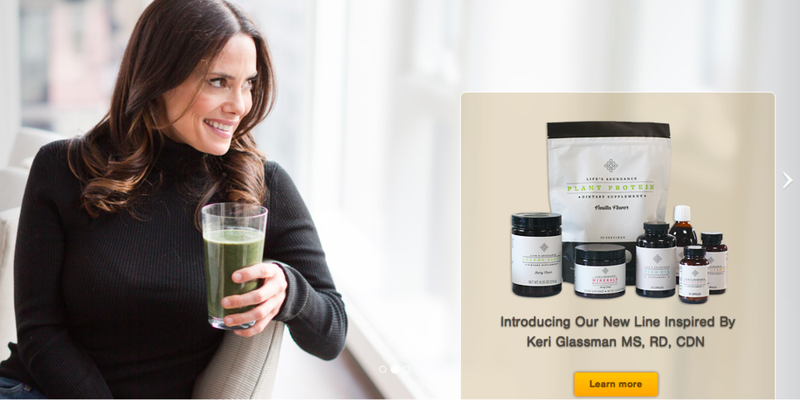 Keri Glassman developed some of the MOST healthy nutritional supplements on the market today. My family and I use these products on a daily basis and when you read the details and ingredients, you'll want them in your life too. For example, There's Coconut Oil in the protein powder!! ...It's a plant based protein that actually tastes amazing!! I'm so excited to finally have products like this that I can feel confident recommending to my readers. Learn more about the Nutrition LIne: Nutritional Supplements - I use all of these products myself and recommend them to my readers. If you are a nutrition, fitness or wellness professional and are interested in learning how to incorporate these nutritional supplements into your practice or business as a form of additional income, email me at shannon@happywifestyle.com or check out TeamSuccessStyle.com. I personally know the people who developed these products and I can show you how.